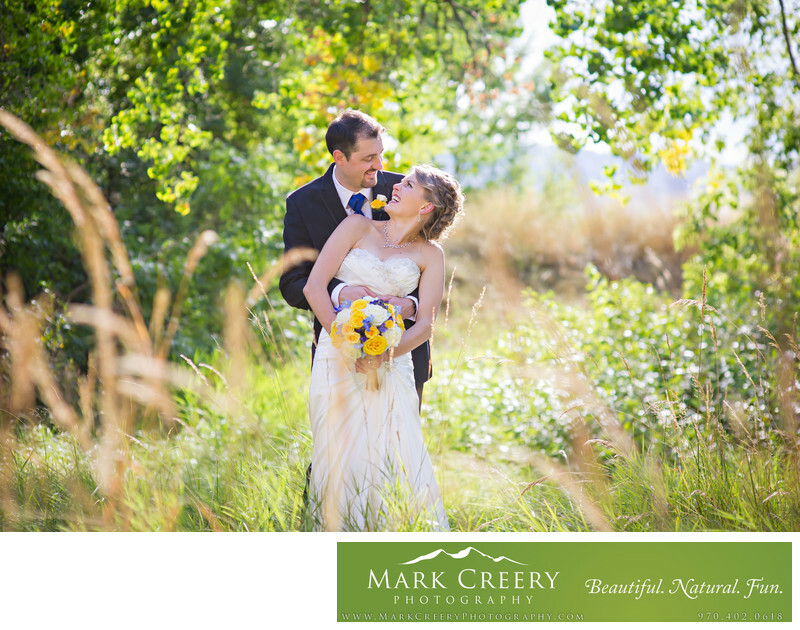 In this playful image of the bride and groom, they shared a laugh as they hugged each other in a grassy natural area. It's the kind of image that typifies my style - a beautiful setting styled by the natural Colorado sunlight, and mixed with a fun emotional connection between the subjects. The Greenbriar Inn is located on 20 pretty acres close to Left Hand Canyon in Boulder, with over 45 years of service. They have several wedding ceremony and reception location options. For ceremony there is the Cabin Lawn, with manicured greenery it is the largest site that can fit up to 200 guests. The South Lawn is close to the Sunroom and has a more enclosed garden feel, with room for up to 180. The Fountain Patio has flagstone flooring and has a wonderful fountain for amazing photos. For reception options, there is the Main Dining Room, with 80 to 130 guests, with expansion options of up to 190 with the Sunroom being used. The Sunroom itself opens up to the South Lawn and has great natural lighting, and more suited for intimate affairs of 20-50 people. The Little Room is the most intimate room, as the name suggests, and has lots of charm and historical features. It fits 5 to 22 guests and is good for bridal preparations also. The Greenbriar Inn is located in Boulder, Colorado. Contact: Kathi Jo Betsinger, (303) 440-7979, gbi@greenbriarinn.com. Location: 8735 N Foothills Hwy, Boulder, CO 80302.